Disclaimer: This is early, early, early days for these guys. In fact, I was their first customer 😛 So take everything with a grain of salt. I’m sure things will change and hopefully improve over time as they get into a rhythm and get to know their smoker intimately and carnally. 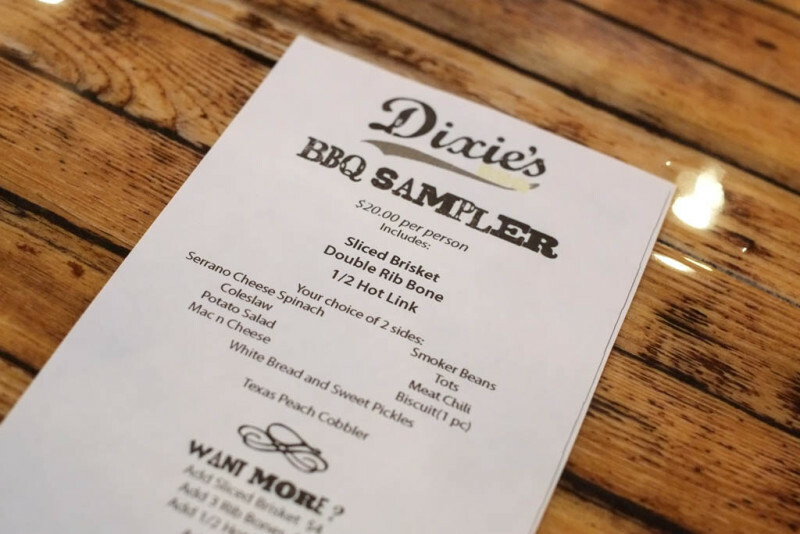 The menu for Dine Out Vancouver/soft-launch. 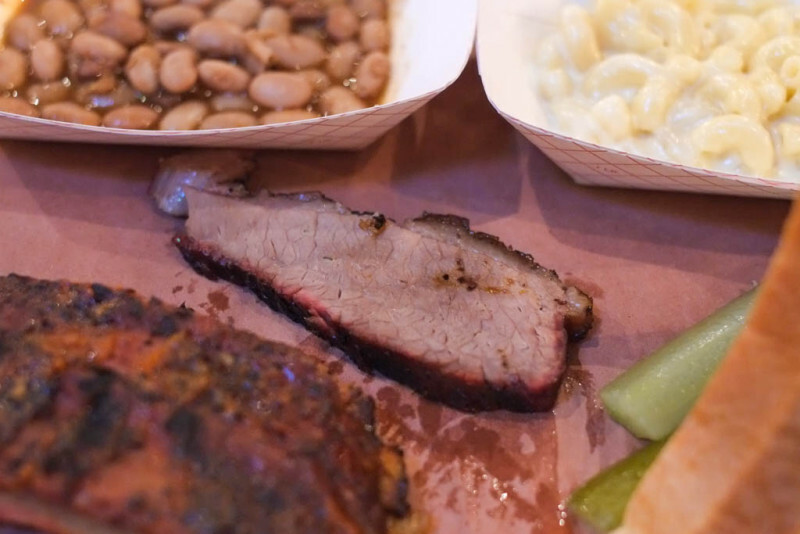 For $20 you get a bit of each of their featured meats, plus two sides. I went for the Mac ‘n Cheese and the Smoker Beans. 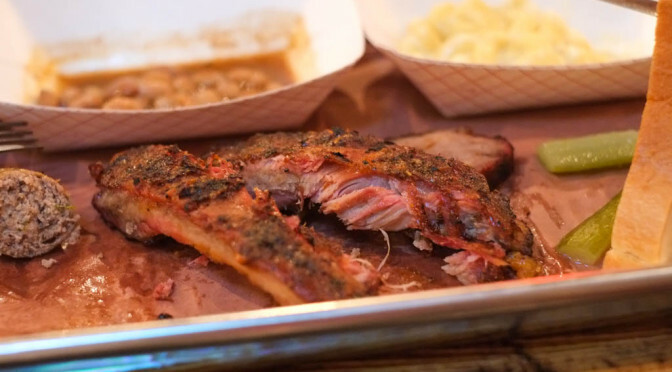 If a slice of brisket, two ribs, and half a sausage doesn’t seem like enough food for you, you can add more. At a cost, of course. Plaid-shirted staff nervously anticipating their first opening night. 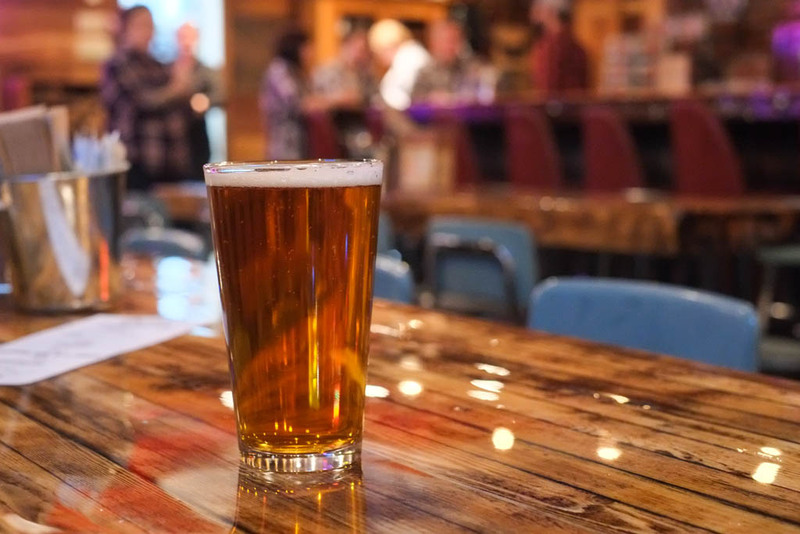 Russell Pale Ale (5%) – It’s got that grainy sweetness that I don’t like, similar to most Granville Island and Big Rock beers. Oddly burnt aftertaste. 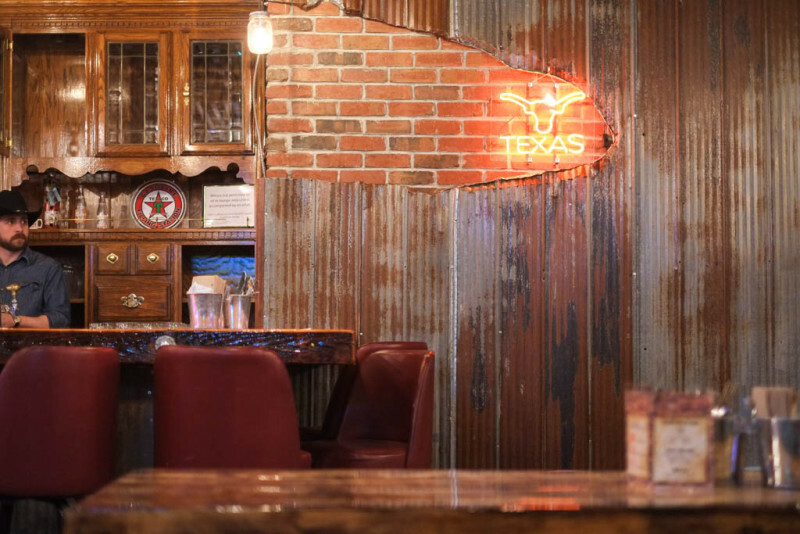 I don’t know how Texan or American the staff is. 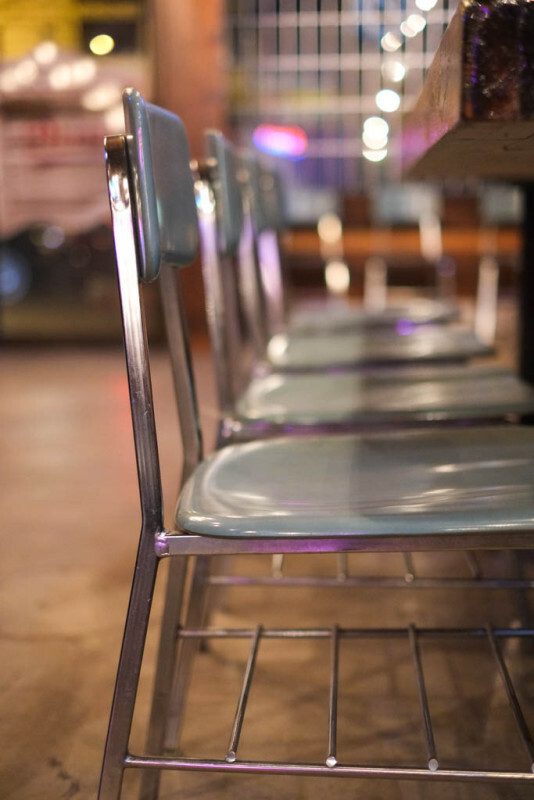 This space used to host pop-ups during the summer, like the Four Winds 2nd Anniversary Pop-Up. They’ve changed the front room quite a bit with the new ceiling and walls. Bar is in the same spot, as are the kitchen and washrooms. However…the location will be a BIG hinderance. Hastings and Gore. A block away from Main and Hastings. 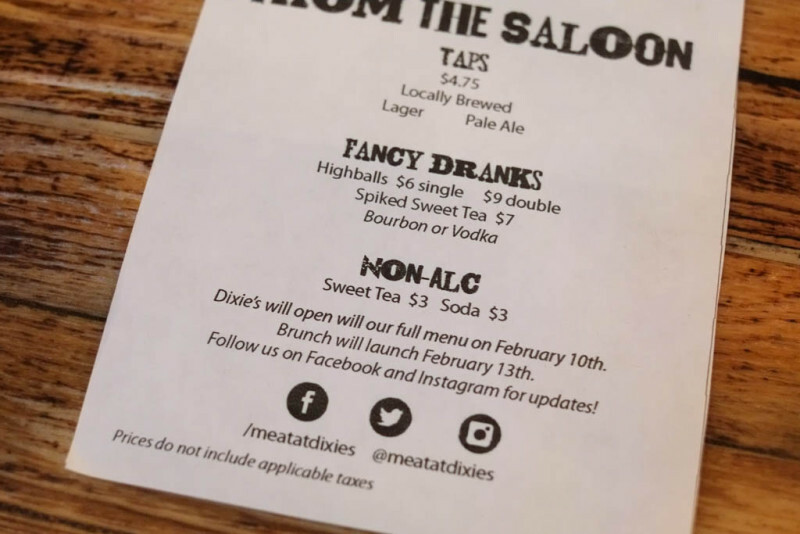 Will the same crowd that keep Bestie, Mamie Taylor’s, Oyster Express, Bao Bei, Sai Woo, Dunlevy Snack Bar (oops), and Alibi Room afloat, keep Dixie’s in business too? 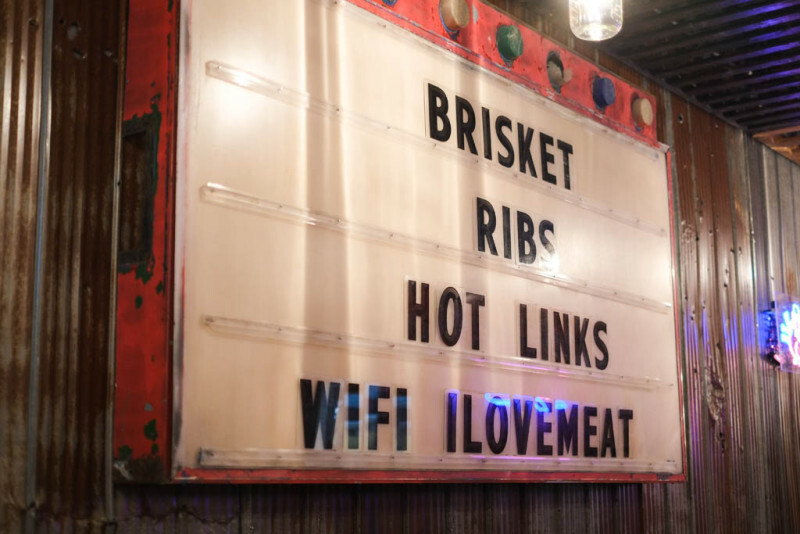 Best wifi password ever. 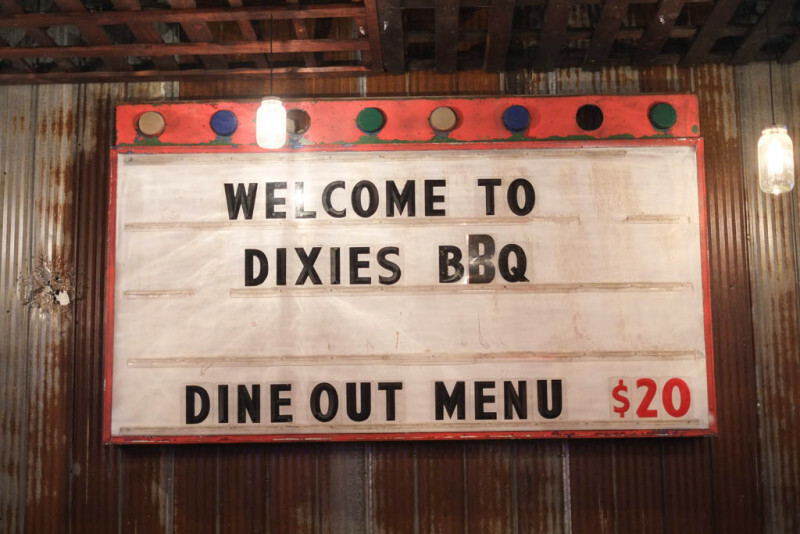 The signage evokes the feeling of American bbq shacks that you’d encounter off the highway somewhere. Lots of rusted corrugated metal on the wall. They have a wood display on the back wall. I was gonna ask what kind of wood they use, but…the proprietress seemed stressed and busy. Understandably. 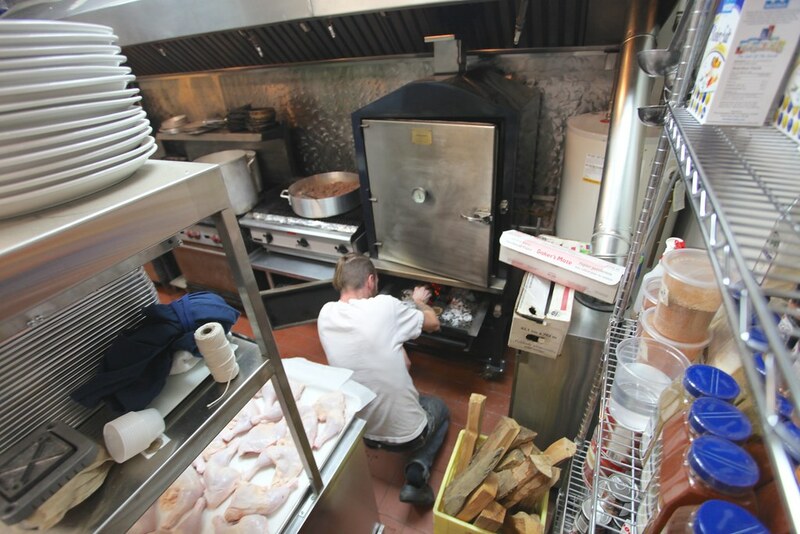 One of the servers said that they use a vertical smoker with a wood compartment at the bottom. Apparently it was brought over from Texas. You can see a picture of it here (courtesy of Scout). I’m so glad they’re at least using some wood. 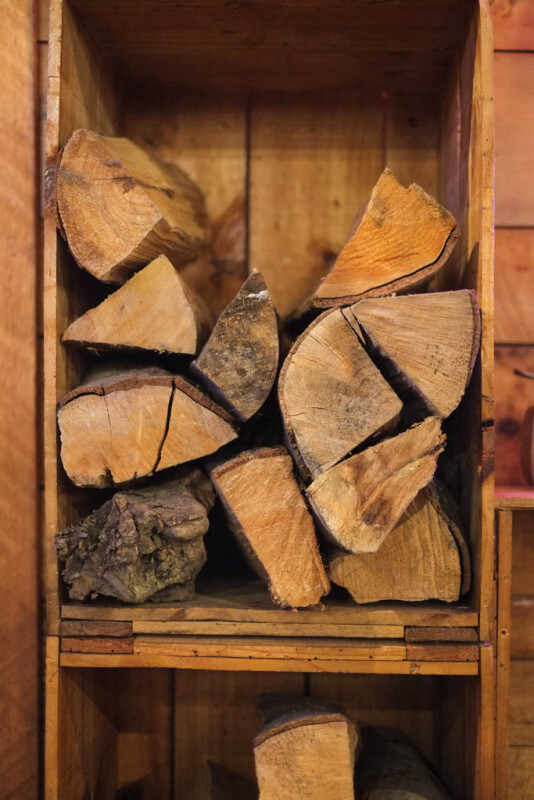 Wood just creates a fuller, deeper, more complex smoky flavour than simply using gas or electric. 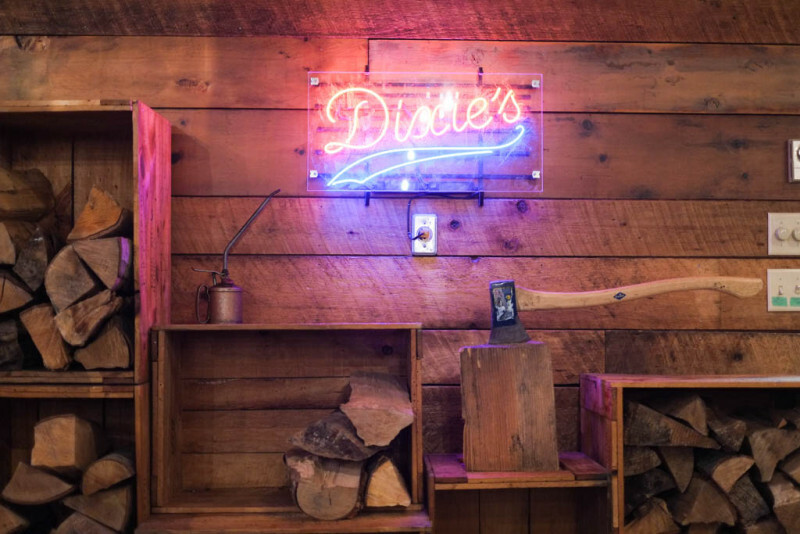 I’m not saying you can’t make tasty bbq without wood, just that once you taste all-wood smoked bbq (like at Podnah’s Pit in Portland), typical bbq just pales in comparison. At least for me it does. 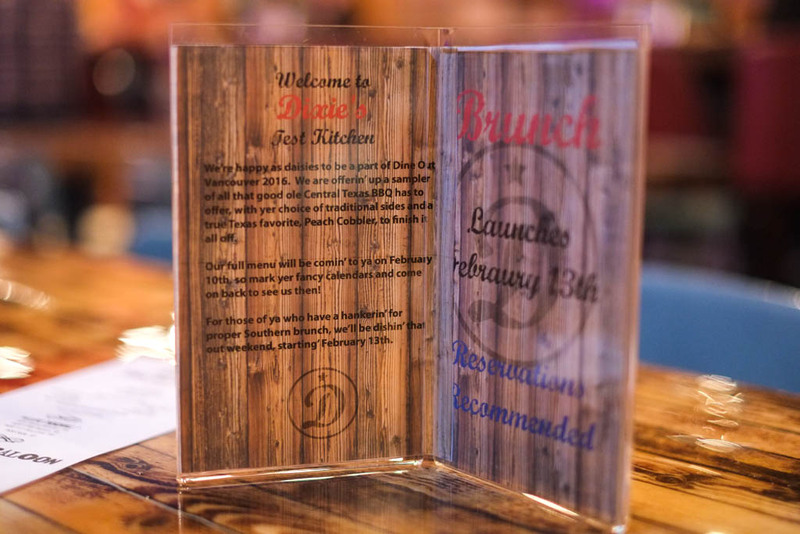 Their grand opening is on February 10, with brunch starting on February 13. All the socal media details. 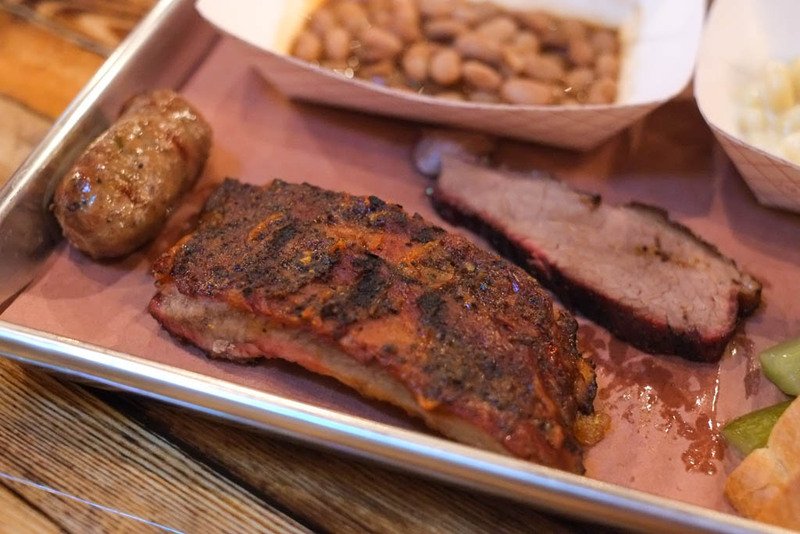 The bbq sampler in all its naked glory. Nowhere to hide. 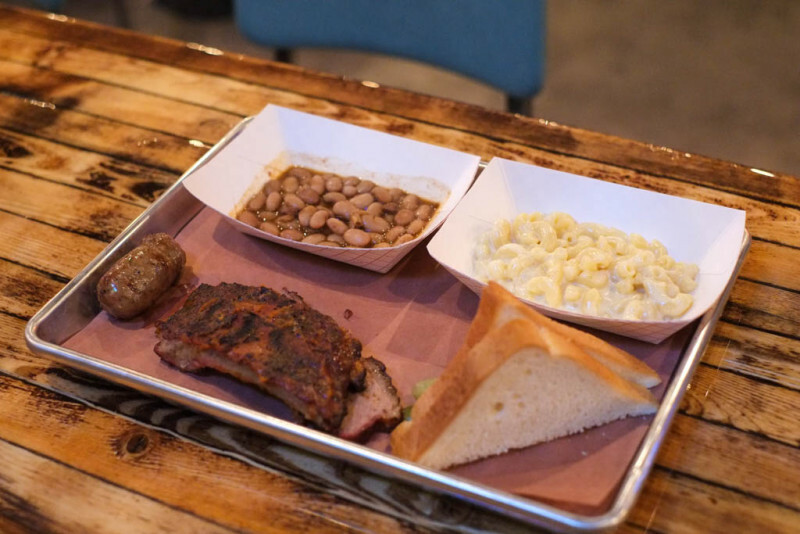 BBQ Sampler ($20) – Comes with half a hot link (sausage), two ribs, a piece of brisket, and choice of two sides (I chose beans and mac ‘n cheese). My first impression was, “[choke] that’s it?” But wait! 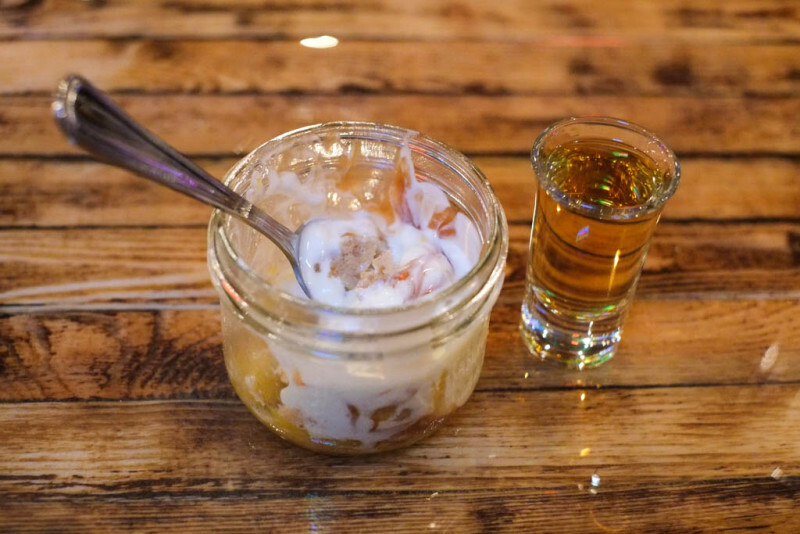 It comes with “Texas Peach Cobbler” as dessert afterwards. Still not convinced? Ah well. No tableside condiments. No sauces. Salt and pepper on request. So with a presentation this bare, the food must stand on its own. Smoker Beans. Didn’t get that much smokiness from these beans. Not sure if beans vary from region to region (eg. 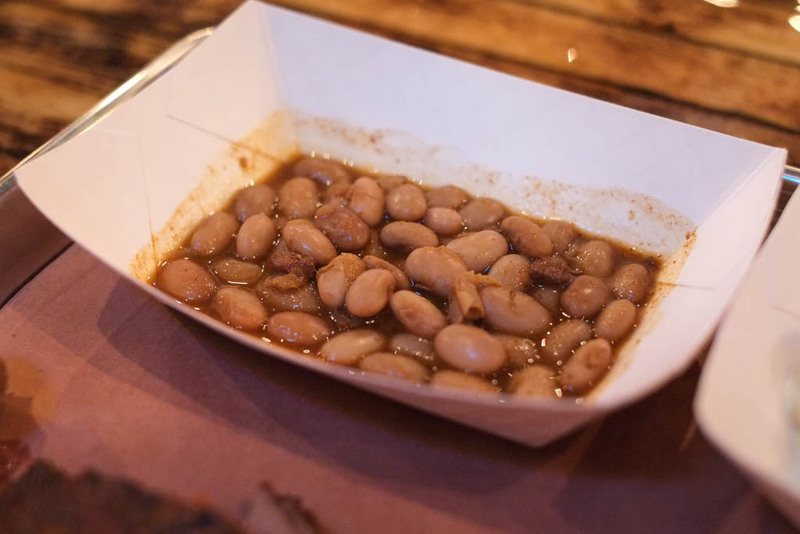 Texas bbq beans vs South Carolina vs Kansas City, etc), but I felt these could be tastier. I’ve had more satisfying beans at Devil’s Elbow. Mac ‘n Cheese. It was on the creamy side. 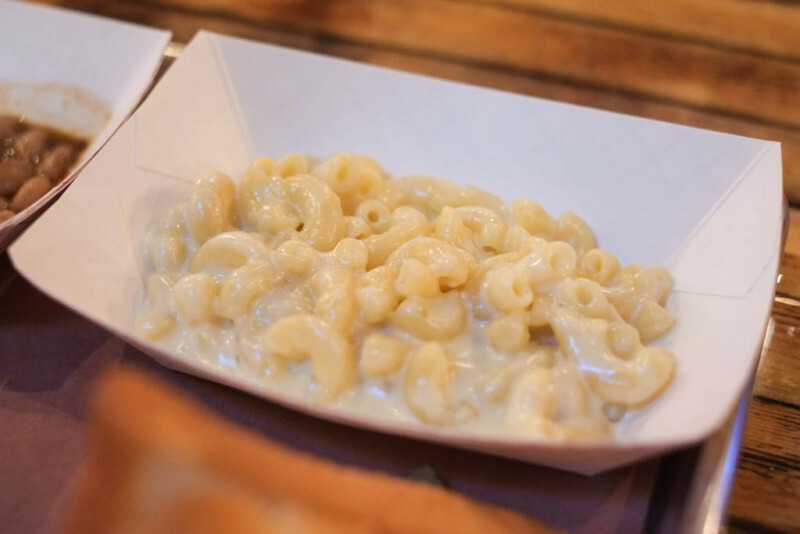 Tasted like a homemade kind of mac ‘n cheese. If I want outside mac ‘n cheese, I want it to be rich and cheesy, the kind of mac ‘n cheese that I can’t (or dare not) make at home. It was fine, but not good enough to crave. And of course, as is tradition, you get two slices of the cheapest white bread available. Also pickles. 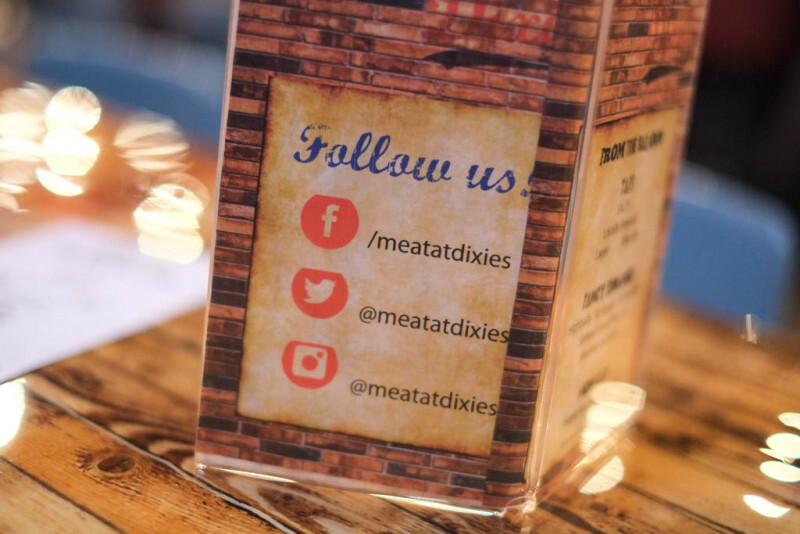 And now for the meats! 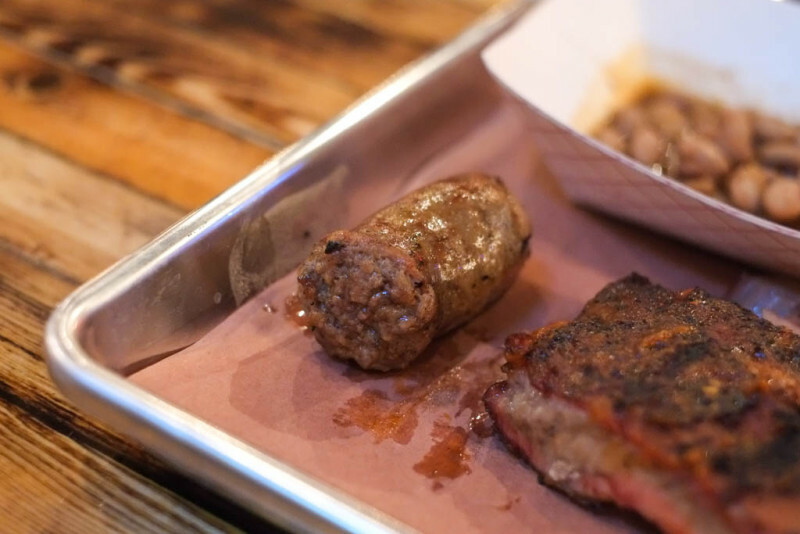 This is all the meat that came with the BBQ Sampler, but it was still enough to give me a good indication of where they’re at. 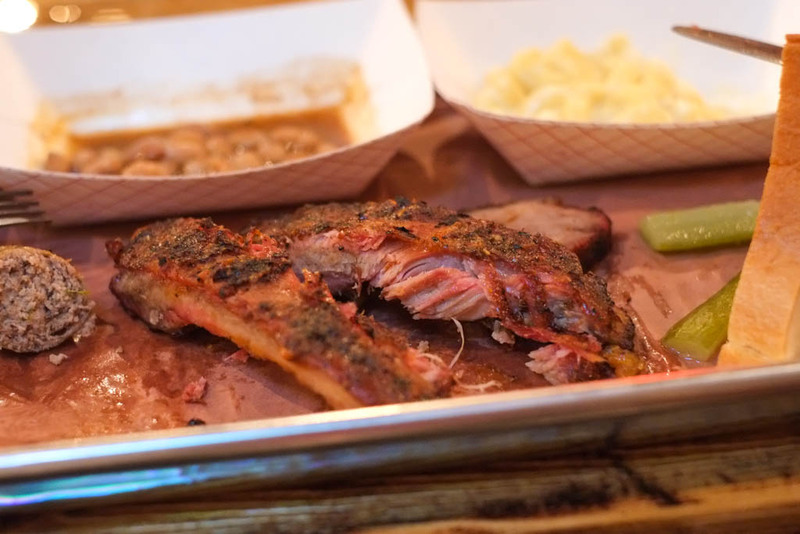 Side note: you must watch BBQ with Franklin (yes, with Aaron Franklin of Franklin BBQ in Austin, TX) to see how much work real barbecue is. It’s also a hoot to see Aaron do the pull test on the finished briskets. Hot Link. The menu says “1/2 Hot Link”, but…damn…that’s stubby. Too dry and lean. Not much smokiness either. Needs revision, pronto! The Double Rib Bone. Turned out to be my favourite meat out of the three. 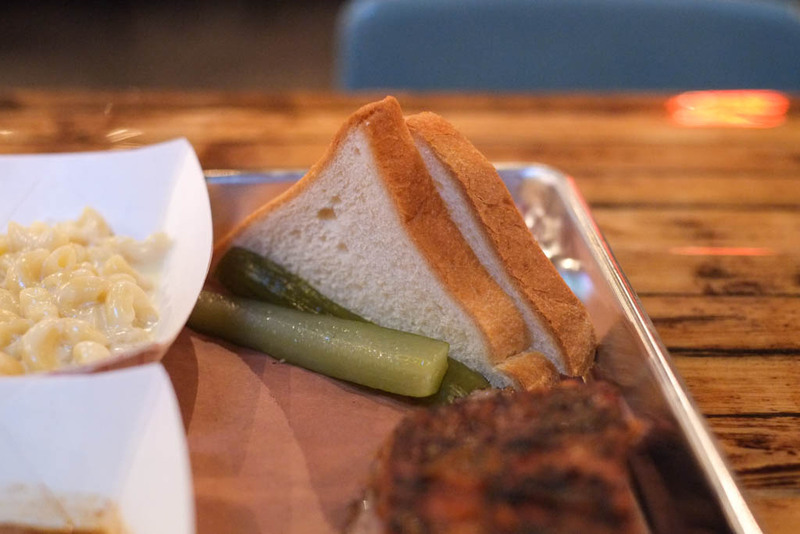 Which is a shame because they really need to up their brisket game. The ribs were a touch salty, but still in the acceptable range. The most delicious part of the rib is the fattier end towards the side that has that chunk of cartilage (in this case, on the left). Dessert! 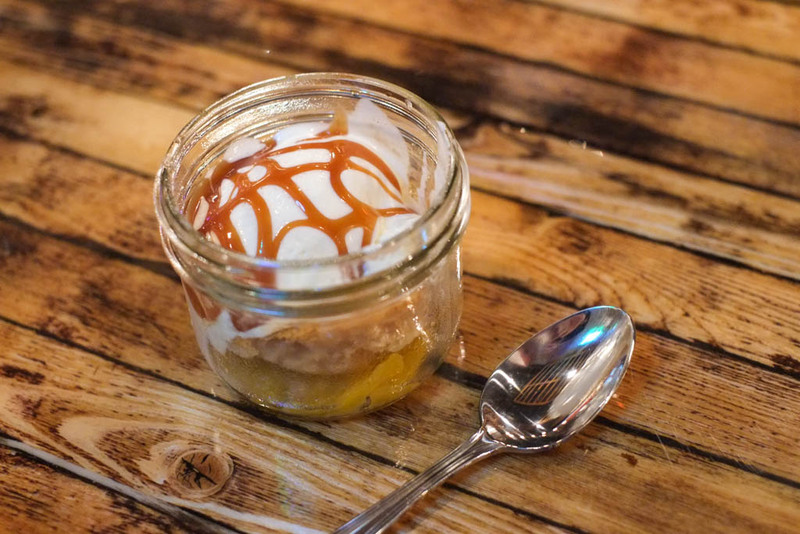 Texas Peach Cobbler. How the hell did they get peaches this time of year? Probably canned. Nicely gooey and sticky caramel on top, with vanilla ice cream, a biscuity cake, and peaches underneath. This really is a nice finish after eating barbecue. One of the owners, Shoel, was nice enough to personally thank me for being their first customer. He gave me a shot of bourbon on the house! And he remembered my name twice. I have to respect that. The bourbon goes damn good with the ice cream in the cobbler. It’s really damn early to be drawing any conclusions from this place. 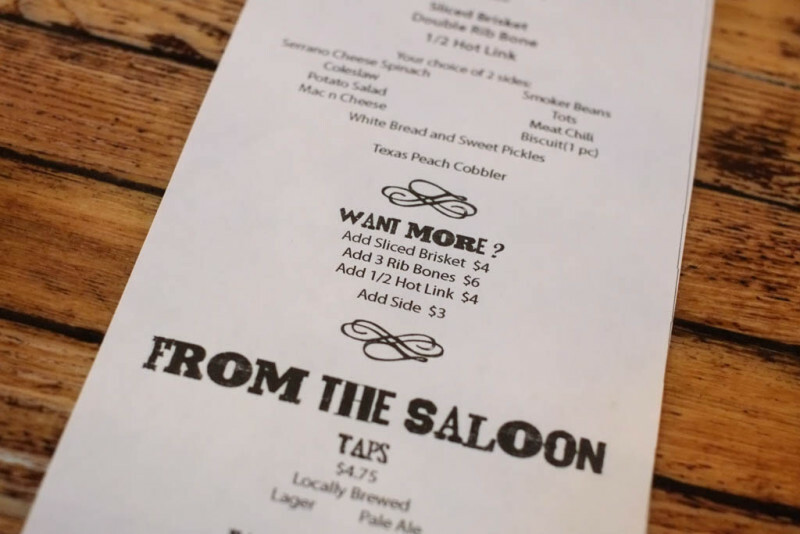 Technically they’re still in soft opening phase, so the food and the menu will change. 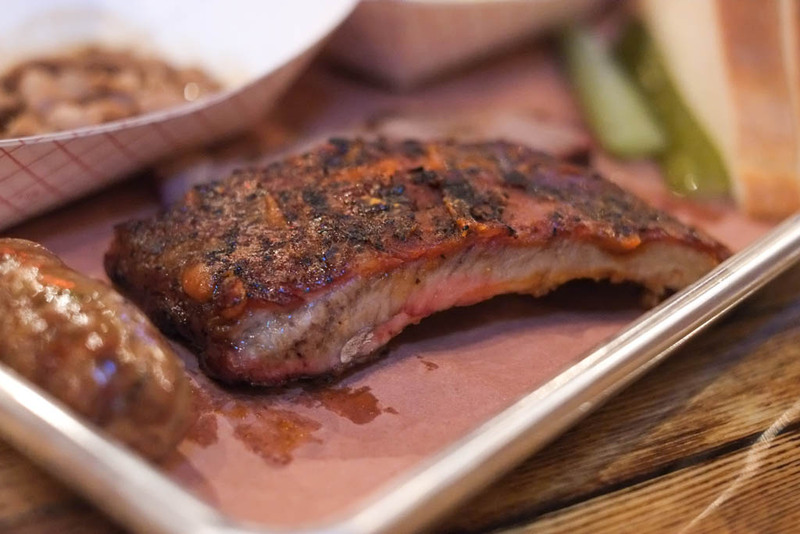 Right now, the ribs show great promise, but the other meats need some work. Do you know who the chef is? Hmm, yeah, challenging corner for sure. And the prices could be a deterrent, if the DOV cost is any indication. Time will tell… thanks for the early glimpse! Interesting location. I too wonder how the prices will keep future business sustainable. Time will tell. Portions look stingy. 1/2 hot link ?? ….. looks like 1/4 or less of something decently-sized. Beans and M&C look un-inspiring. 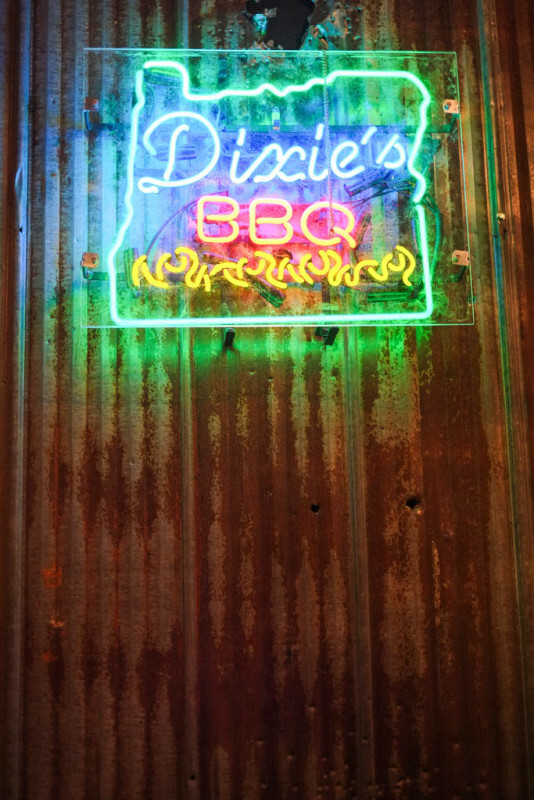 Curious why *good* BBQ brisket is so elusive in our town ? Hope their hard opening will be more promising.